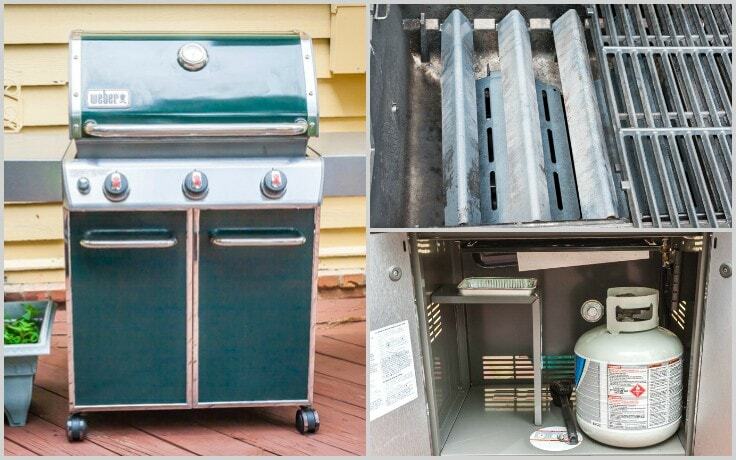 This post gives you step by step instructions showing you how you How to clean a gas grill easily with minimal fuss! We’ve had our Weber Genesis gas grill for about a year now, prior to that we had a charcoal one which worked well but my husband was getting a bit fed up of having to clean out the ashes every time he wanted to use it. While we clean the cooking grates on our gas grill every time we use it, I confess that we have not really cleaned it much beyond that, shame on us! Last week our hand was forced as we had a bad flare up/fire after cooking some burgers so ignoring the much needed cleaning was no longer an option as there was no way we could cook anything on it until it was properly cleaned. 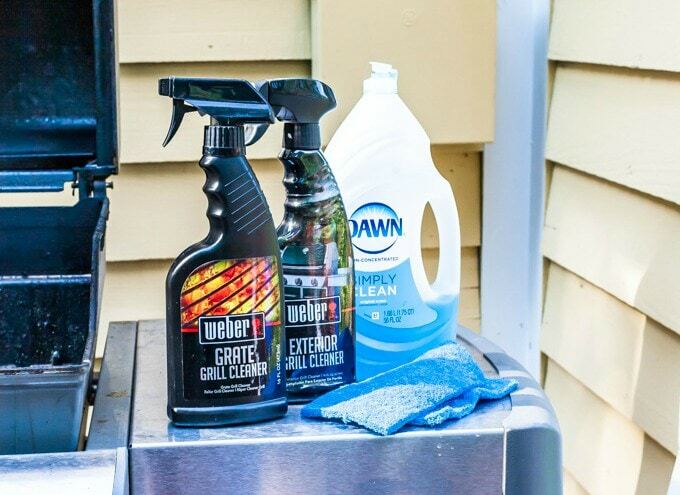 Thankfully cleaning a gas grill is not overly complicated, it just requires a bit of elbow grease and some everyday cleaning products, and remembering where to put back all the grill parts! Some Dawn dish washing soap, stainless steel grill polish, green nylon pot scrubbers, warm water in a bucket, cloths for buffing and wiping, a stainless steel grill brush and if your grill is really dirty and has layers of grease on it you may also need a paint scraper to get all the gunk off. I found a garden hose to be helpful for blasting off some of the dirt from the grill parts that I had on the grass and rinsing off the clean grill parts, but it’s certainly not essential. Before you start cleaning you should consult the manual for your grill as it may have different parts to mine and require different care. 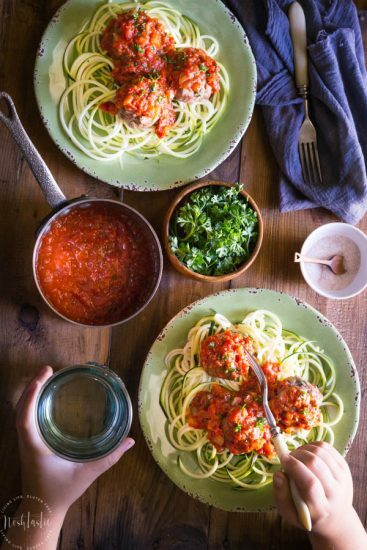 EASY GLUTEN FREE RECIPES YOU’LL LOVE!! I have a lot of gluten free recipes on my blog that I hope you’ll check out while you are here! These are just a few of my favorites. My Paleo Italian Meatballs with Marinara Sauce recipe is one of my most popular posts, it’s very easy to make and tastes great! 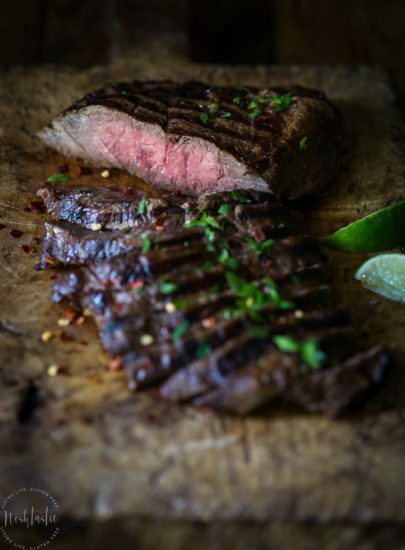 My Marinated Flat Iron Steak recipe is really easy to make and perfect for grilling! Looking for some salad recipes? 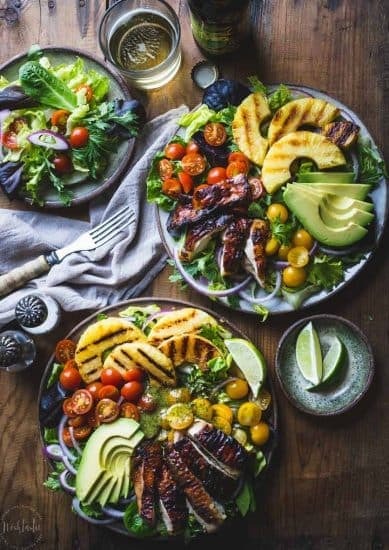 Then you’ll love this Cilantro Lime Chicken Salad with Grilled Pineapple, it’s so easy to make on your grill. 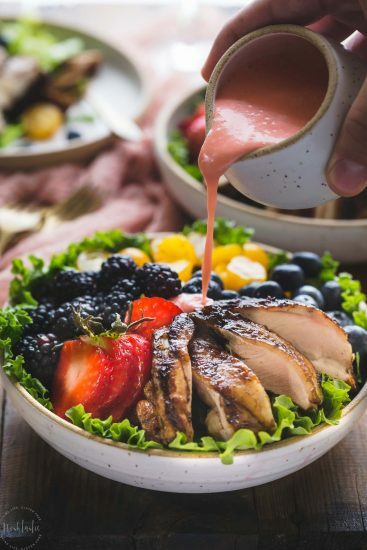 Or how about this salad instead, I promise this Paleo Balsamic Chicken Salad tastes as good as it looks and you can cook it on the grill without too much fuss. Make sure the gas to the grill is switched off and your grill is not hot. I started with the interior of the lid and used the green nylon pot scrubber to scrub it down with hot water with some Dawn soap mixed in . If you have a lot of black flaky carbon material (it’s not paint, so don’t panic) built up on the inside of the lid up you can use the grill brush to get it off, or the paint scraper if it’s really thick and greasy. When you’re done scrubbing, rinse it down with warm water. Scrub the cooking grates with the grill brush while they are still in place, then remove them, the flavorizer bars and heat deflectors if you have them. I put all these parts on to the grass in my back yard, so that all the burnt on stuff that came off wasn’t all over the deck as I cleaned them. 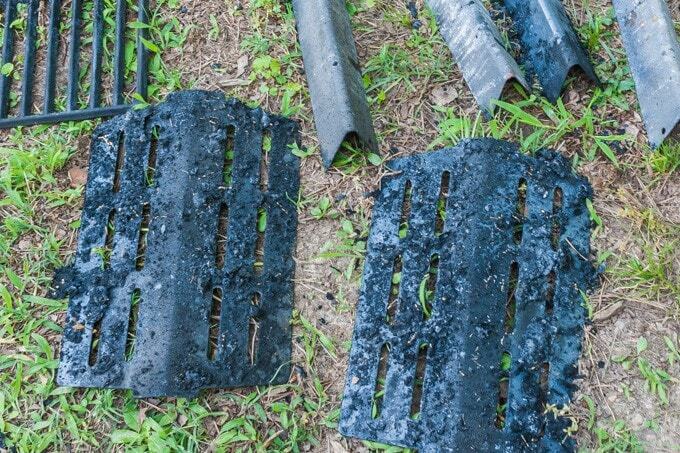 I found that a lot of the burnt on gunk came off easily when I blasted them with the garden hose while they were lying on the grass, so you might want to try that. I cleaned the flavorizer bars and heat deflectors with the green nylon scrubber and a bucket of hot soapy water, then I rinsed them off with the garden hose and placed them up on the deck to dry. For the cooking grates I scrubbed them on both sides with the grill brush and then finished scrubbing them with the green nylon scrubber, I also rinsed them off with the hose. Now you want to clean the burner tubes, that’s the part where the gas flame comes out. Clean the little holes with your grill brush in a side to side motion across the holes. 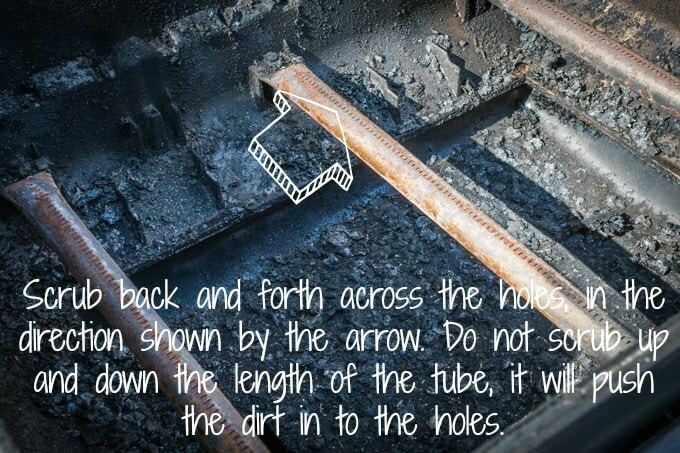 Do not scrub up and down the length of the tubes or you will end up pushing debris into the holes. Once you’ve cleaned the burner tubes use your nylon scrubber and some hot soapy water to scrub and clean the rest of the inside of the grill, working from the top down. If you need to, use the paint scraper tool to remove excess grease and gunk from the inside of the grill and into the tray beneath. When you’re done, rinse it off or wipe clean with clean warm water. Next you want to remove the bottom tray and catch pan and wash them clean with warm soapy water. Then you can wipe out inside the bottom part of the grill where the gas bottle is stored. When everything is dry return all the parts to the correct place inside your grill. Washing the exterior is easy, just use a soft cloth and clean warm soapy water. Rinse with clean water, then buff with a dry cloth. I used a stainless steel polish to get a really nice shine on it after I buffed it dry. Here’s some pictures of the grill after I cleaned it, it looks a whole lot better than it did before and our grilled food tastes better too! 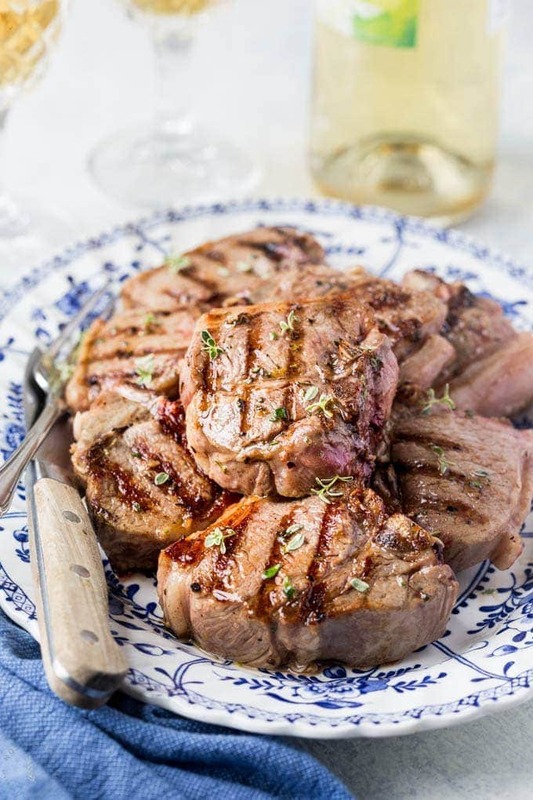 We love these Grilled Lamb Chops, they are just perfect on the grill and super simple to make! 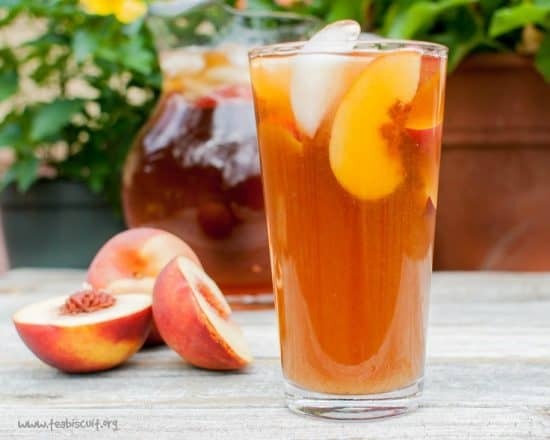 No cookout would be complete without a couple of drinks to enjoy, so how about some Peach Iced Tea? 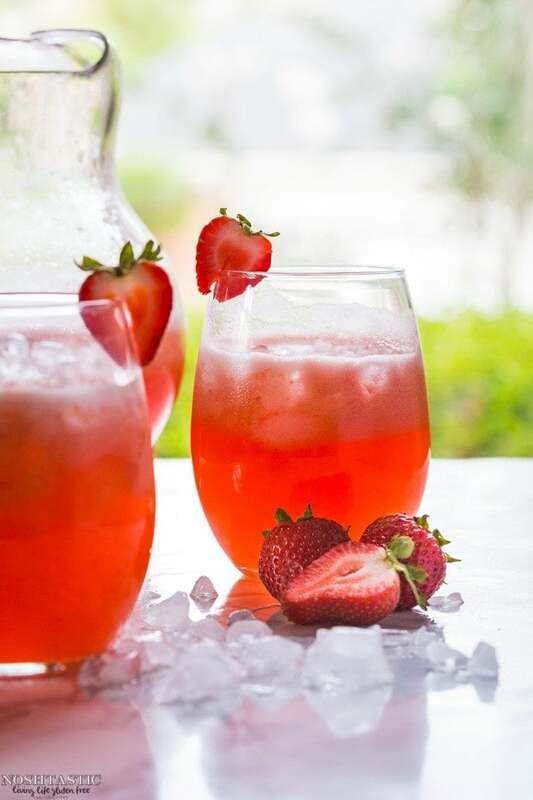 Or if you want something a little different my Strawberry Lemonade is always a hit with the kids! Wow! Great tutorial! What a yucky job, but you did so well. We don’t have a real grill so ours is a bit easier to clean. It was a grim job but somebody had to do it! It cleaned up a lot better than I expected. Ha! I could totally have used this BEFORE I made the Thai Grilled Chicken 🙂 Thanks for the tips! Have friends coming round for a BBQ this weekend and I DO need to give my grill a proper clean! Great post!! I have 2 built in grills, a 30″ & a 40 “, & have never been faithful in cleaning them. This might give me the “push”!! PLEASE NOTE!! DO NOT USE WIRE grill brushes!! DO NOT!! I recently read a report that the wires break off on the grates & end up on your foods while grilling. People end up in ER EVERY YEAR because of this. The wire pieces are found lodged in their esophagus or even in their stomaches!! I threw all mine away, even a new one with tags still attached. I didn’t want to be responsible for some one buying it at a thrift store!! Use nylon scrubbers or wadded up aluminum foil. The best is to burn off foods left behind when finished grilling. Thanks Debra, I just googled about the wire brushes, YIKES!! I’ll be sticking to the nylon scrubbers from now on, we usually burn off the grill before cleaning it anyway but now I’ll be more diligent, thanks for letting me know! I take all the grill plates and flavorizor grates and brush the big stuff off and put them in my self-cleaning oven. When it’s done I just rinse the pieces off. While the parts are in the oven I clean the inside and outside of the grill. Better yet place piece of wood on grass,put grates etc.on wood and pressure wash,quick and my opinion cleaner without scrubbing or chemicals. Hi Donna, yes that would work too, I wish I had a pressure washer! I just used a hose and blasted off most of the dirt that way. Fyi if you take a piece of aluminum foil put it shiny side down with your gas grill on till it stops smoking it leaves a white ash but all the grease and gunk are gone and no nasty scrubbing I have been doing this for years. Hope this helps someone lol because I hate scrubbing the grates. Definitely did it the hard way! 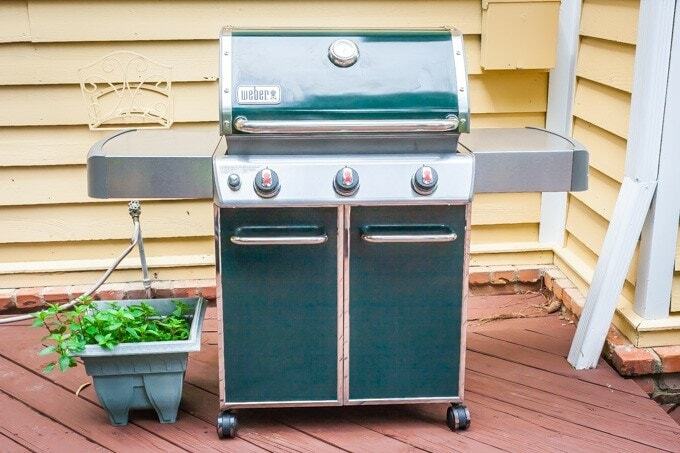 A lot of the gunk comes off easier if it’s hot and you use a metal grill brush… forget the scrubbing, too! Get a metal scrubber attachment for the grates and tough metal parts, then switch over to the scrub brush and scrub pads…. Or, we can BOTH be smarter and put it all in the oven like Gary up above does!